Discussion in 'Creations' started by Noxite, Jul 30, 2015. The Noxcrew Gameshow is a tournament series for Youtube that was made over the course of 6 months by our team of ~30 dedicated and creative people, all in Minecraft. The Noxcrew Gameshow is all created and manufactured inside a gigantic factory. Contestants are invited and led into the factory to play their matchups. The Factory has a very efficient tube system that transports the contestants and hosts around the factory to all the different games. 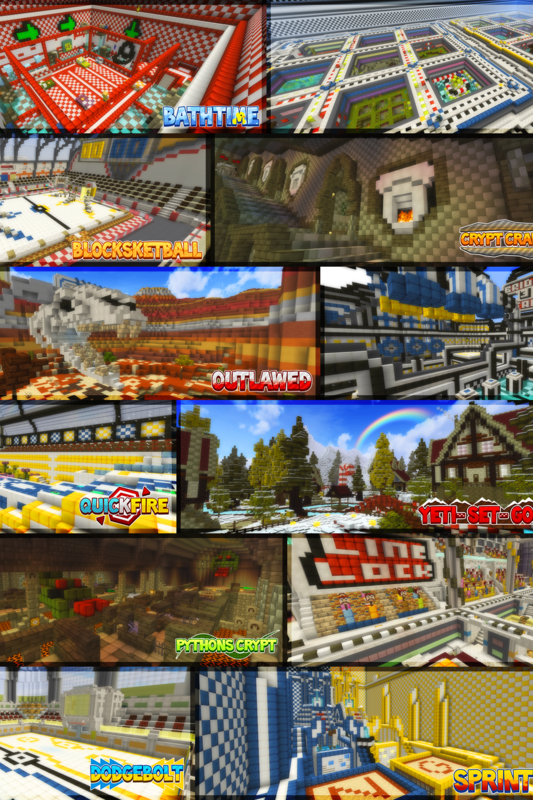 The factory consists of over 30 different mini-games with all their different rule-sets and themes. We're always creating more and more mini-games and adding them to the factory to keep it all fresh. But we also love remaking classic games that the audience love and would like to see more of in a new light! We have a mini-game bank where all the games are shown and described in more detail. Each mini-game gets its own stylish logo, detailed graphical overlays and even its own music track made by our composers in the crew! This is to ensure that the audience always has enough information to be able to watch the game and follow the action! As a bonus, the awesome music is always released royalty-free to the public! We use this crazy contraption made purely by command blocks that we call "The Decision Dome". 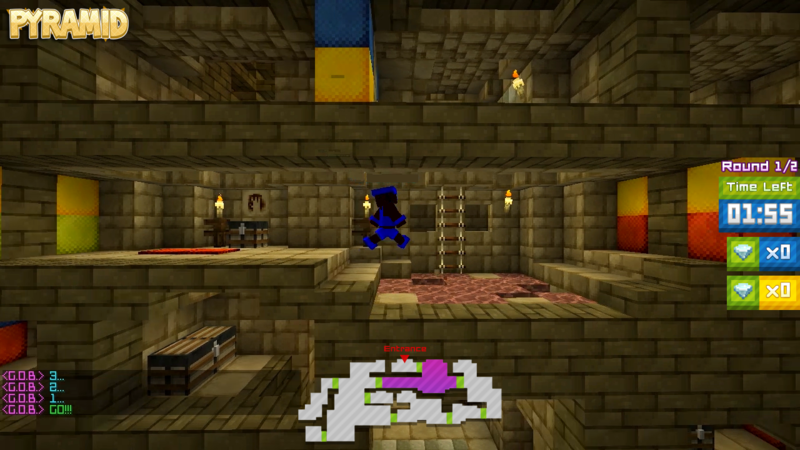 The idea is that there are 8 potential mini-games lined up around the dome with a corresponding segment. A load of chickens are spawned from the 'Big Chicken' and after they land, the segment with the most chickens picks the mini-game we'll be playing for that episode. Afterwards, we have 'The Butcher' who comes out of his quarters to clean up the chickens with his knife so that the Decision Dome is nice and clean for the next sequence. No real chickens are hurt during the making of this series. We can't say much for the virtual chickens though. For Season 1, we opened an application system for the community to apply and play in the tournament series. Members were required to sign up in teams of 3 (As the mini-games are all 3v3 situations) and record an introductory video so that we could get a feel of their personalities. We received just over 80 applications, but only 8 of the best teams were selected and pitted together in a tournament ladder to attempt to win the NGS Trophy. Each team submitted their own crazy name and in return received a high quality drawn logo to represent their team. Each match-up is a 'Best-Of-3' situation, where the final is a 'Best-Of-5'. After the season is over, the community will be able to vote on our forums for their two favorite teams to come back and verse each other off for one last 'Best-Of-5' bonus match. 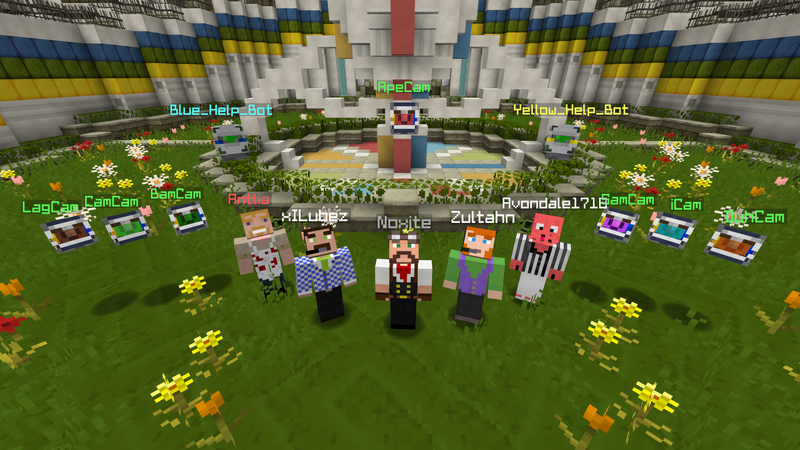 To make it fun and feel like a true gameshow, we've created many characters and skins for roleplay. There are 7 camera-men (4 are filming every game-night), 2 help-bots who assist each team by talking to them in robot-language, the butcher (Antlia) who cleans up the chickens in the decision dome, Avondale who acts as a referee in games that need it (Lobsterref), the two commentators (xILubez and Zultahn), and finally the host; Noxite.